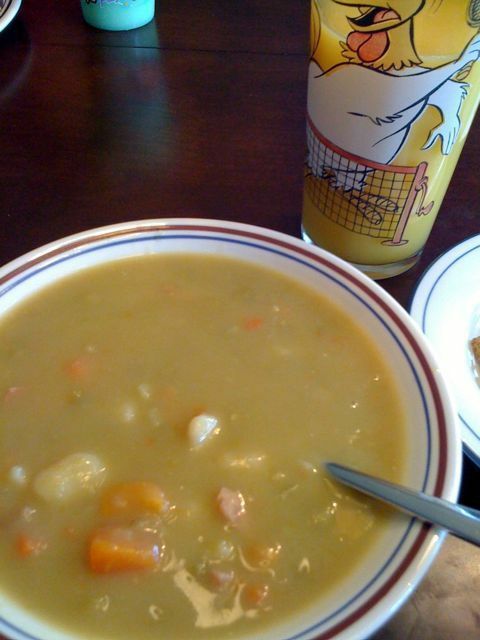 I know I’ve posted out of sequence today but truthfully, the only reason I took this picture of my split pea & ham soup was because it looked like a lunch a Packer fan might love–because of the orange juice. 2. Smoothies–yay or nay? Like Dean, I find myself leaning to the Punish Them! side, but if milkshakes are OK as a “drink”, smoothies should be, too. I have had a smoothie as a beverage alongside an overpriced wrap. 1. I am going to try that lamb stew recipe. 2. Moosewood Cookbooks are great sources for soup, though vegetarian ones. I’ve made their lentil soup many times and it’s very good and exceptionally good for you.